Have you ever found yourself wishing the word NO was not in God’s vocabulary, or at least one He rarely used? I have, and almost as many times as He used the dreaded two-letter word. I must confess while I’ve never really heard Him say, “NO!” He doesn’t need to His silent methods are more effective. Yesterday morning I was praying about a great idea/focus I had for some future Glory Seeds so after getting myself all fired up I sat down at my computer and found myself drawing a blank, it was as if someone walked inside me and pulled the plug and suddenly everything went dark. It’s now Wednesday morning, October 7, 2015 and after sleeping on it last night I’ve come to the conclusion the someone who pulled the plug on my great idea/focus was the Holy Spirit, God has His own plan right now and it doesn’t include mine. That’s not to say that my plan was bad or anything it may just be the wrong time. God works like that doesn’t He? I have discovered in many cases when God answers NO without a reason (we might not understand it anyway) it’s not a definite NO, it’s a “not right time NO. 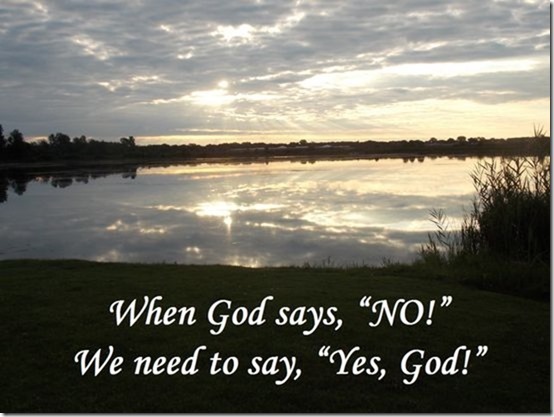 One of the biggest traps we sometimes fall in when God says, “NO!” is the NO trap, we concentrate on the NO and its impacts and fail to understand God may have something better going on in our lives. Isaiah tells us God says, “Look! I am about to do a new thing! Now it sprouts! Do you not perceive it? Indeed, I will make a way in the wilderness, rivers in the desert.” (Isaiah 43:19, LEB) Another thing that falls by the wayside while NO has us trapped is our focus on our timetable and not God’s.